There are a number of reasons shingles blow off your roof. Here are some of the more common ones. The original roofing installer “high nailed” this means they din’t put the nails in the right spot when nailing the roof. If they put them in the right spot the nails go into the top and bottom shingles. Which means each shingle will have 8 nails holding it in if they use the recommended 4 nails per shingle. Sometimes in high wind areas and to upgrade wind warranties with manufactures roofers will use 6 nails per shingle. The shingle sealant strips have giving out. 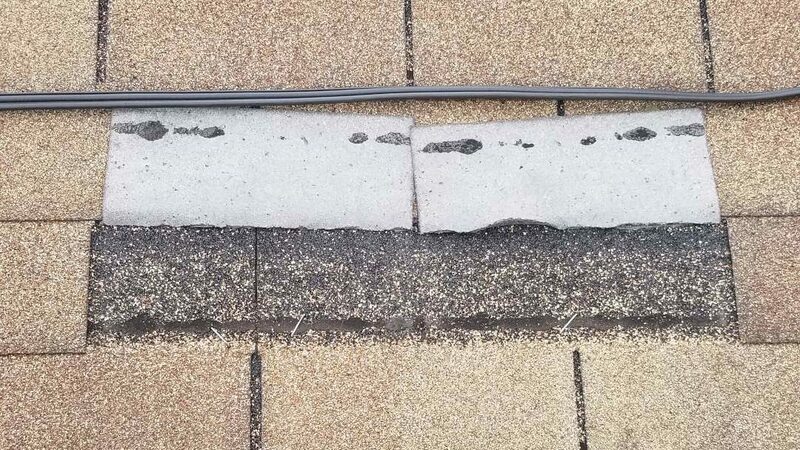 This happens with age of the shingle usually around the 1O year mark or so but this also depends on the type of shingle used. The most common shingles to suffer blow offs we see are standard 3 tab shingles. Most all the time but not always if you have architectural shingles and they are coming apart or blowing off it’s from high nails. Nails not being in the right spots to hold them together properly. Sometimes we see just a bad quality sealant strips that din’t seal the shingles to start with. We see this usually with off brand shingles or sometimes with major manufacturers that just had a flawed product. Rotted roof decking could be a culprit too. If your plywood is rotted it will not hold the nails properly the secure your roofing to the roof deck. We also see if you have a older home and not ply wood then you have 1” boards and they have gaps and if the roofer nailed in the gaps then you have issues. Severe high winds can blow shingles off especially worn roofing or shingles around the 10 year mark. 3 tabs are rated for 60-70 mph winds and architectural 110-130. But these shingles need to be nailed properly and in fairly good condition with sealant strips sealed to sustain high winds like this. Give us a call today we are #1 in roofing repairs and we want your business!